It seems that lately I've been hearing an awful lot about wine bottles. Being someone who doesn't partake myself I decided that I'd work with Perrier bottles. But no one told me that there was a distinct learning curve when cutting glass bottles. A quick trip to the hobby store and a few attempts these beautiful pendant lamps came together! Not gonna lie... cutting wine bottles isn't going to go perfectly on your first attempt. I tried several methods and the one I liked best came from Saved by Love Creations. With a bit more practice I think I can cut rings like Johnnie! 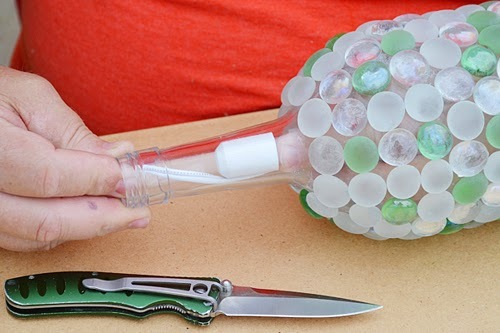 This method includes a bottle cutter that scores the glass followed by a butane torch. 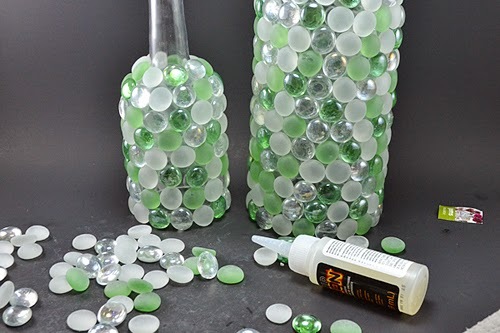 You can also cut wine bottles using nail polish remover and string with help from Jade at Jaderbomb or with a scorer and boiling water, though I couldn't get this method to work it's supposed to lead to the least sanding which would be awesome! Whatever method you choose plan on plenty of practice and lots have lots of glass to practice on. You won't get the perfect cut the first go 'round! Here is my bottle. Hardly a perfect cut but good enough since we'll be covering it up with stones. 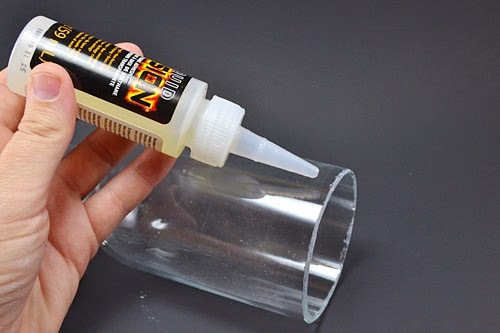 Be sure that the bottom of your glass is NOT jagged and will NOT cut you before moving onto this step. If in doubt, don't use it because glass cuts can be nasty business. 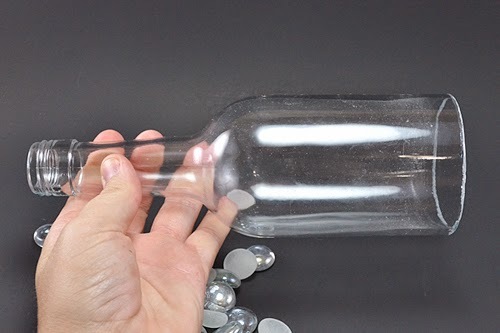 Give the outside of your bottle a quick sand to score taking care not to breathe in the dust or get it into your eyes. Sanding is IMPERATIVE to a good hold. Grab your Liquid Fusion and get comfy. This takes a while but cures so well that it's worth the effort. 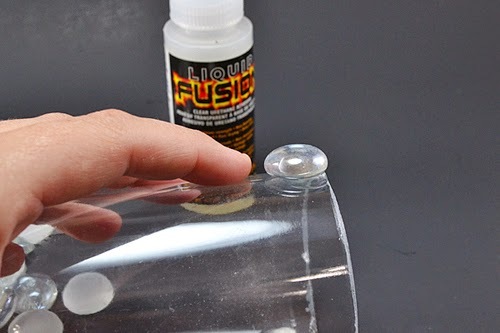 Place a small dollop of Liquid Fusion near the rim of the bottle. And place your first glass gem. 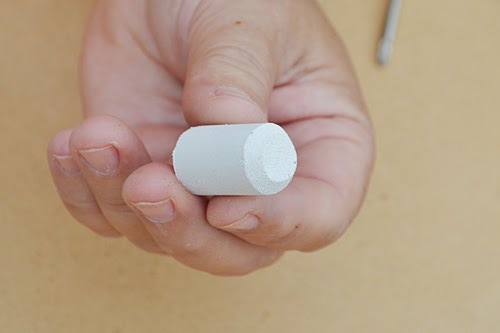 You'll need to hold into place until the glue dries well enough to hold on its own. Continue adding gems around in rings from the bottom to right below the neck. 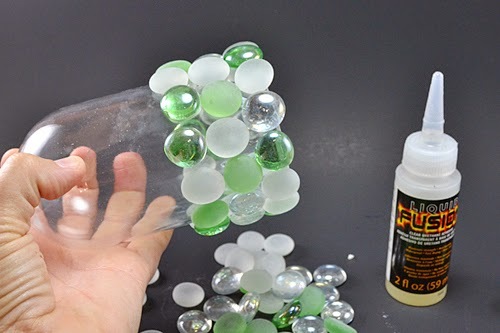 Do this for as many bottles as you have. This is a great time to check out TV you're behind on or catch a few movies. Again, this is slow going but it's easy and the results are worth it! Allow the bottles to dry 24-48 hours. This is the end of your light kit. 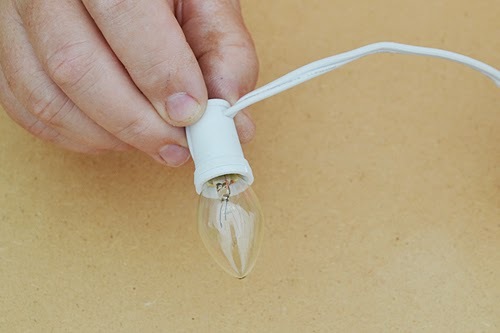 Mine uses an itty bitty bulb (because it's what I had on hand) but they have others that will put out considerably more light by using bigger bulbs. Remove the metal bracket that comes on around the socket. 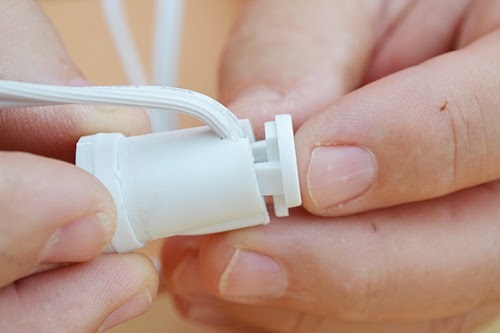 Above the socket and the cord that goes into the end, there is a little space where you can slip the end of a knife or screwdriver. Gently pry that up to pop the lid off. Remove the cord. It will easily come out by simply pulling up. 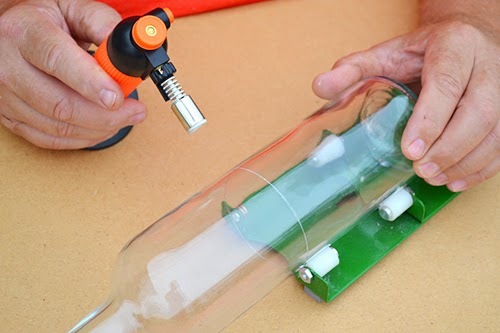 Thread the cord through the bottle and put the cord back as you found it. Slip the cap back onto the socket. Give a test to make sure the wire is back as it should be and the lamp lights up. In order to get our light to hang where we want it and not in the neck, grab a piece of wooden dowel and cut down to 2-3 inches in length. Paint white so it will be less obvious. This one has a tapered end which is nice but not necessary. 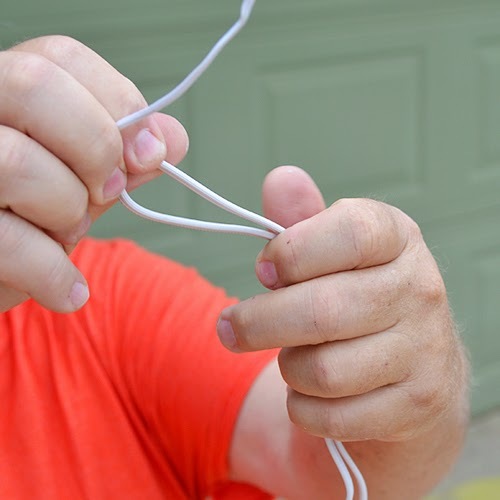 Get your cord where you want it to be from inside of the glass. Next jam that dowel piece as far into the neck as you can. 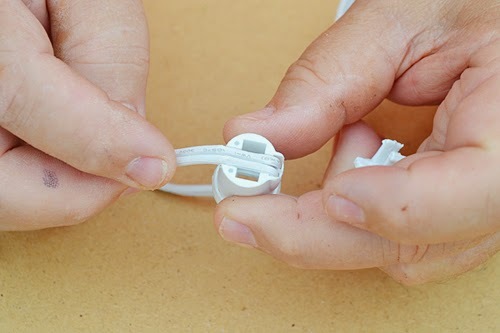 With enough pressure, it will hold the wire in place and keep your lamp light exactly where you want it. 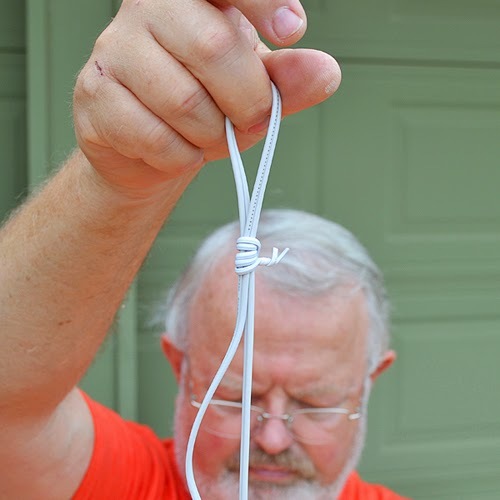 and wrap the tie around and around to secure a loop for hanging. Finish applying your glass pieces to the neck and give a good 24-48 hours to cure completely. And if you're wondering, we didn't gem up the necks before now because you will wind up kind of manhandling that area to get the lights in place. With enough force you can knock your gems off a you'll be back here again anyway! There they are! My larger and smaller wine bottle pendants. These both have a considerable amount of heft to them but hanging for quite some time there have been no issues with the cord holding. The different colored gems add a lot of interest to the look and I love how the colors glow! To be honest I think I'll be changing out the light kits with ones that will hold regular sized bulbs to get more light out of them, but for ambient lighting or a nightlight these guys are pretty perfect. Oh, and I'll be switching to a daylight or Reveal type of bulb so that the colors that come through are more true to the stones and less yellow. So what do you think? 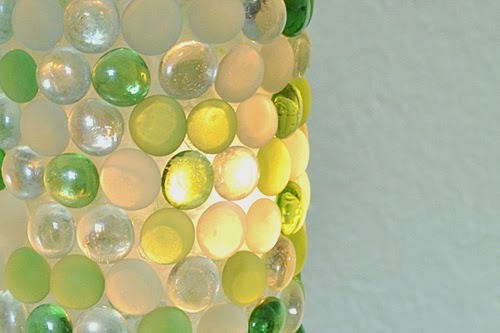 A little bit of Liquid Fusion and some gems later and I've got some eye catching lighting... will you make some, too? Hi Allison! Thanks for the tutorial. This is a very timely post for me. I just purchased the G2 bottle cutter this past weekend and I hate it. Very unstable to get a straight cut. The one that Saved By Love used is pretty expensive, so not sure I want to invest in that. So what cutter are you using? And do you recommend it? Mine is Ephrem's Original Bottle Cutter. It's wonky as all get out but there's a learning curve. You can't cut the bottles really close to the bottom with it so that limits the height. To be honest Johnnie's cuts are so consistently fab I wonder if it isn't because her bottle cutter is way better than mine. If you don't want to spend the money, you might want to try the flaming yarn method from Jaderbomb. Thanks Allison. What a bummer that you can't cut near the bottom! Actually I have an idea now on how to rig up my own cutter. If it works out, I'll be blogging about it. If it doesn't, well it'll go in the pile of all my fails. Lol. Awesome post! 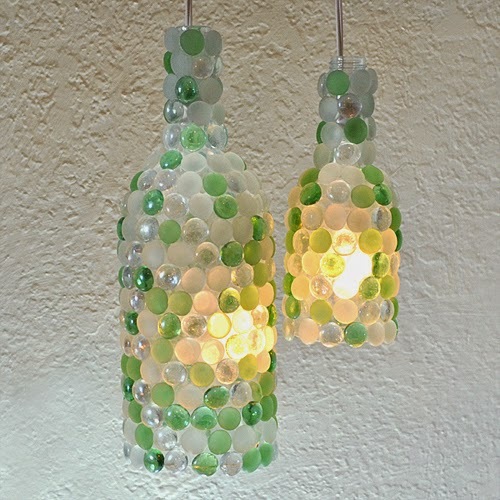 very nice wine pendant lights. Get a chance to buy online pendant lights , energy saver hanging lights in India at best prices which gives a great look to your home. One of the most common areas within the home where you will find contemporary pendant lighting is in the kitchen. Gracefully hanging from the ceiling these light used to illuminate a kitchen counter or centre island. this one is one of the best article on glass pendant lighting.These pendant lights can be used for decorations in kitchens, bathrooms or any room you prefer to make more stylish and lively. Seems intersting but isn't this a bit hard to do? I found some interesting concepts also on another website but yours looks nicer. Precise Lighting store is a shopping store where you can get a wide variety of lighting materials at reasonable cost. Any type of lighting accessories can be found here; Bulbs, Ceiling Lights, Chandeliers, Commercial Lights, Outdoor Lights, Spot & Down Lights, Stage & Club Lights, Switches & Sockets, Wall Lights and what not. The lights are very pretty and unique. metals hanging lightShop from our wide range of Metal Hanging Lights & Pendant LED Lamps at very reasonable price . Metal Hanging Lights is very beautiful and expensive. Metal Hanging Lights are considered as among the essential and innovative developments in the lighting industries. great idea! I can make it for my outdoor garden. Thanks for sharing with us. Lighting store offering premium superb Led lights, Pendant lights and electrical fittings at a reasonable cost. Get Pendant lights Australia. Here are alternative for the pendant lights, pendant light, pendant lights australia, web based lighting, table lights and Pendant lighting. These are beautiful! Thanks for sharing the tutorial for making pendant lamps. 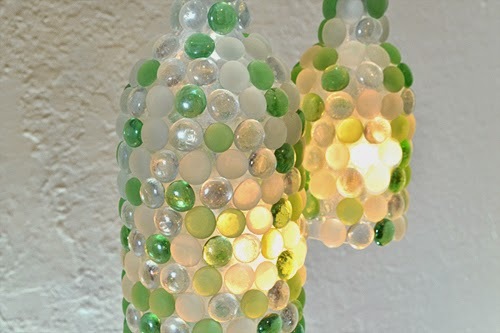 I would love to hear more details about making the wine bottle Vanity lights! 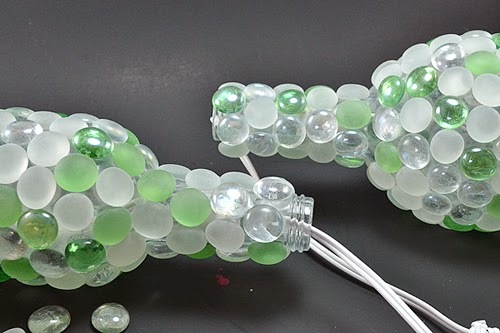 You have shared great tutorial for making pendant lamps.The above points will surely going to help persons who are eager to get knowledge for making pendant lamps.Thank you!! 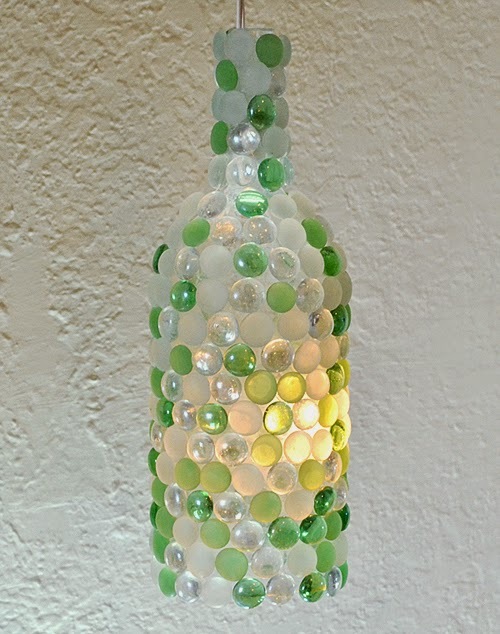 Great Job Allison.i found you can purchase the larger wine jugs or Apple cider jugs to create a center piece light or perfect out on the deck.The necks are widern no problem using larger blubs inside. pendant lamp WoodLED SQUARE 600 wooden luminaire made of American walnuts used as the main lighting in the bedroom of a family house. The Trilum wooden luminaire match ideally with natural and simple interior of the family home. The frame of the luminaire was chosen according to the dark wood used in the interior. 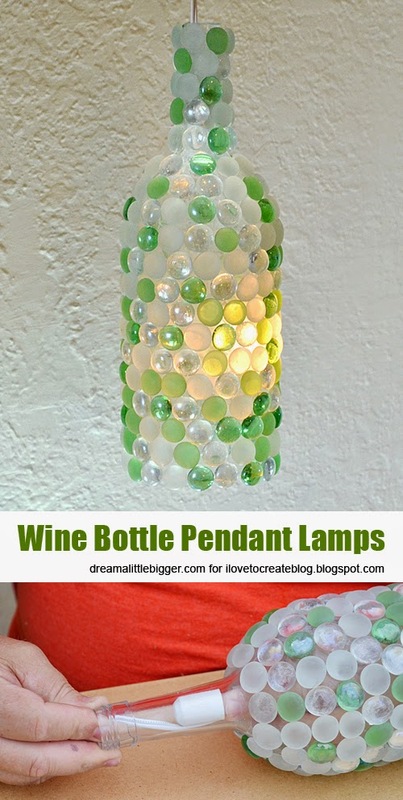 I am going to use these not as a hanging light but set the bottle over a led candle and use them on tables. Nice Blog, I go through your blog and i got lots of interesting things,which could be beneficial for me in future.thanks for sharing such a nice blog. For Chandeliers, Lighting, lighting fixtures, crystal chandelier, wall sconce, Pendant lighting, flush mount lighting, lights, luxury chandeliers, ceiling lights you can visit our site. Wow, Great Blog, I go through your blog and I got lots of interesting things, which could be beneficial for everyone. I'm really inspired by your blog content. Thanks for sharing such a nice blog. For Chandeliers, Lighting, lighting fixtures, crystal chandelier, wall sconce, Pendant lighting, flush mount lighting, lights, luxury chandeliers & ceiling lights you can visit our Website or Contact Our Toll-Free Number: 1-844-694-5489 or Contact Our Email ID: info@cairo-glitz.com.